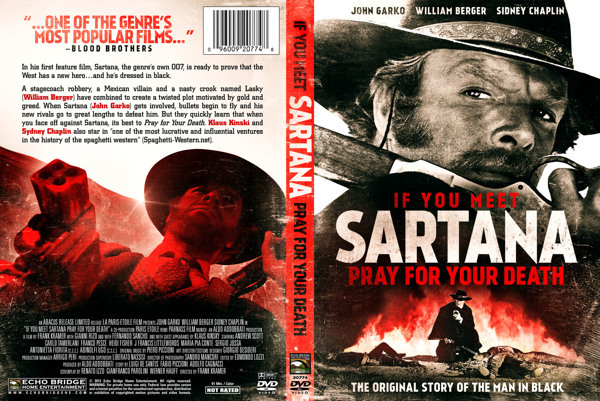 Sometimes known as SARTANA THE GRAVEDIGGER, this film, second in the series, has Gianni Garko, billed as John Garko for the American release, finds our hero framed for the bank robbery of an impenetrable bank. Bounty hunters were hired as guards and one dressed in the distinctive style of the most famous bounty hunter of them all engineers the theft, leaving him holding the bag. 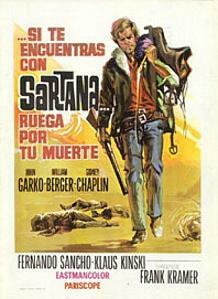 A reward is put on Sartana’s head. Bounty hunters Hot Dead(Klaus Kinski) and Deguejo(Gordon Mitchell) take up the hunt. Soon the real Sartana, alarmed at what’s going on, starts looking into it. He has an assistant, Buddy Ben(spaghetti vet Frank Wolff), that serves as his Watson in this detective tale. The trail leads the pair to Poker Flats where the game is wide open and crime running wild. 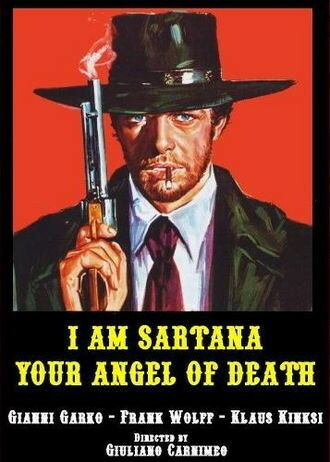 Sartana is less spectral here, more of a straight forward western character. The directing reins were taken over by Giuliano Carnimeo(billed as Anthony Ascott) after some fall out between the first film’s director, Gianfranco Parolini, and some of the production people. Fans were divided on the turn of the series with this film and it’s moody, episodic framing. It retained the violence and atmosphere of the first, but giving it a burlesque air in the Las Vegas style Poker Flats. 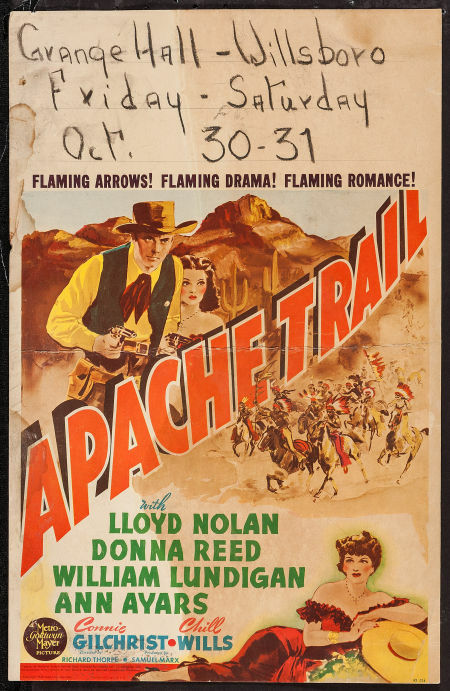 From 1942, APACHE TRAIL stars Lloyd Nolan and William Lundigan as brothers “Trigger Bill” and Tom Folliard, two men on opposite sides of the law. Trigger Bill takes after their father, always out for the easy score, and Tom is more like their mother, easy going, basically honest. 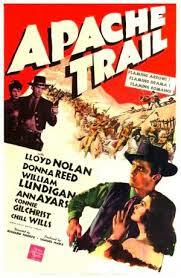 The film is based on a short story, Stage Station by Ernest Haycox. Trigger Bill’s attempts to toughen his brother up results in Tom spending three months in jail after he’s bullied into a stage robbery attempt. He doesn’t flee like his brother and the others when the law jumps them. He’s finally released after three months in jail by a circuit judge that never even gets out of the stage, citing “consorting with known criminals” as the charge. Tom can’t get his old job as shotgun guard back, but the Wells Fargo man believes in Tom and offers him a job as station master right in the middle of Apache territory. It’s about to be closed down because of the danger and finding someone willing to run it. Tom knows everyone from his former job and all finally agree to stay on. Donna Reed plays Rosalie Martinez, the “almost eighteen” daughter of the station’s cook, who’s always had a thing for Tom. A stage, with a strong box of money and passengers, pulls in shortly, just ahead of an Apache war party, soon followed by a cavalry officer. Someone has stirred the Apache up. and not too much later, Trigger Bill shows up. Tom is immediately suspicious, with that strong box of money on hand. He takes his brother’s guns, not willing to send him back out. The next morning an arrow is shot into the stage and Tom decides to sneak out and do some scouting. The strong box is locked up and he tells his men to keep an eye on Trigger Bill. The cavalry officer leaves as well, heading to a nearby fort with plans to send help. 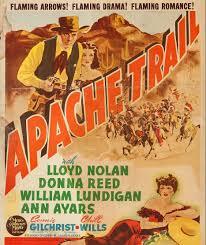 Tom spots an Apache party with a white prisoner who he frees with a bit of guile. On the way back, he hears a tale of a white man, adopted into the tribe, then slaughtering a number of Apache and taking a peace pipe. Geronimo and his people are looking for him. Getting back to the station, he’s just in time to catch Trigger Bill trying to flee with the strong box and one of the women. 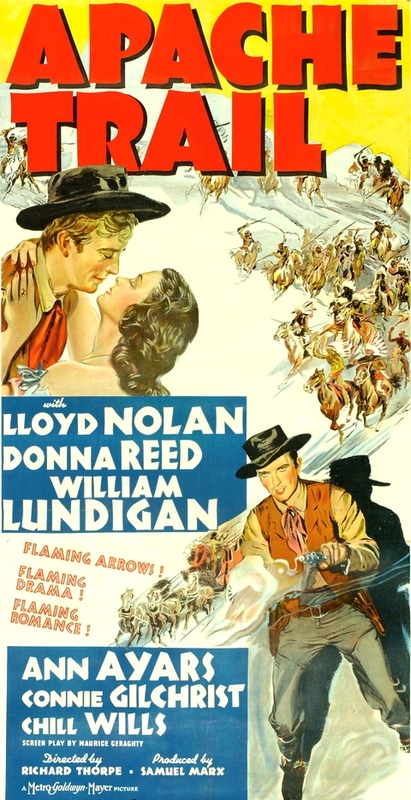 In the gunfight, Tom outdraws brother, putting a bullet through each hand. They find the peace pipe on him and learn the truth. We learn different though, with both men showing a brotherly love that neither probably would have believed even just a few days before. Interesting film. I enjoyed Nolan in the Mike Shayne movies from that same period. I’d never seen him in anything from his younger years, always playing character roles in films I had seen previously. A number of those faces one sees in movies without knowing names pepper the rest of the cast. The only one I could name was Chill Wills.
! 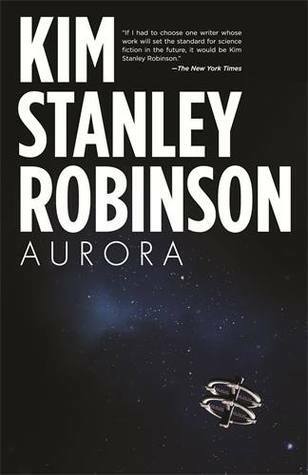 : Aurora(ARC) – Kim Stanley Robinson: A major new novel from one of science fiction’s most powerful voices, AURORA tells the incredible story of our first voyage beyond the solar system. Our voyage from Earth began generations ago. Now, we approach our destination. A new home. AURORA. 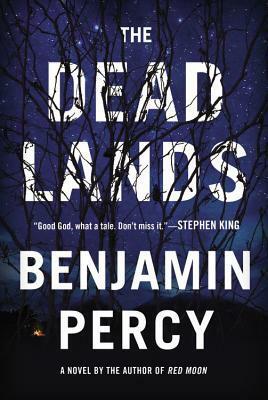 3: The Dead Lands(ARC) – Benjamin Percy: In Benjamin Percy’s new thriller, a post-apocalyptic reimagining of the Lewis and Clark saga, a super flu and nuclear fallout have made a husk of the world we know. A few humans carry on, living in outposts such as the Sanctuary-the remains of St. Louis-a shielded community that owes its survival to its militant defense and fear-mongering leaders. Then a rider comes from the wasteland beyond its walls. She reports on the outside world: west of the Cascades, rain falls, crops grow, civilization thrives. But there is danger too: the rising power of an army that pillages and enslaves every community they happen upon. Against the wishes of the Sanctuary, a small group sets out in secrecy. Led by Lewis Meriwether and Mina Clark, they hope to expand their infant nation, and to reunite the States. But the Sanctuary will not allow them to escape without a fight. 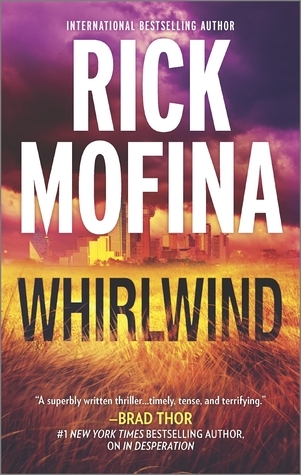 4: Whirlwind(review copy) – Rick Mofina: An anguished mother loses her baby in a deadly storm… A kind stranger helps Jenna Cooper protect her baby boy when a killer tornado rips through a Dallas flea market. But in the aftermath, Jenna can’t find her son or the woman who’d been holding him. A journalist under pressure breaks the story… Upon discovering the tragedy, reporter and single mom Kate Page, battling for her career and trying to hold her life together, vows to determine what happened to tiny Caleb Cooper. 5: Starship Excelsior – Alan Lockley: It was the dawn of man’s last great adventure, a journey to the stars. 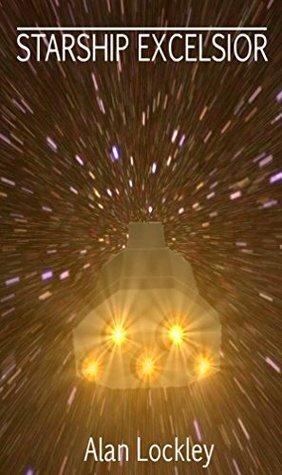 Man’s vision for years and now, the starship Excelsior was set to begin its long trip to Alpha Centauri, the nearest star to Earth. The crew of three men and the most sophisticated android ever built, Doctor Wang, were ready to go into the unknown. Professor Jason Ashton was determined the mission would succeed but at what cost? Excelsior had hidden secrets, secrets that only Ashton knew. 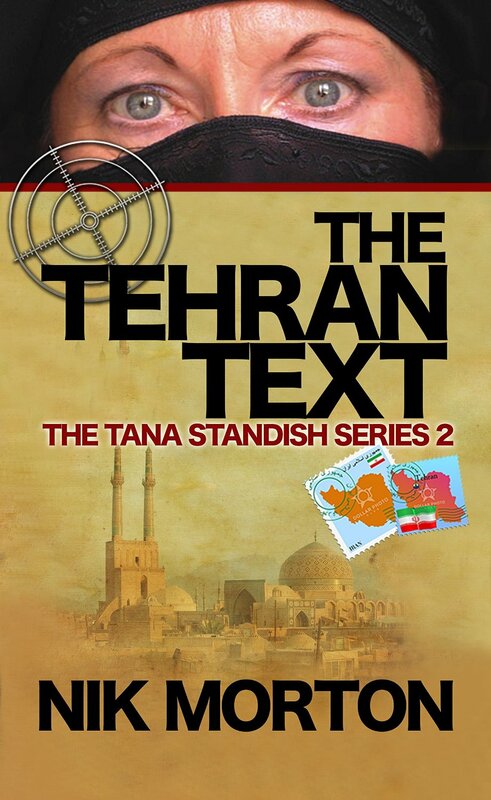 6: The Tehran Text: The Tana Standish series – Nik Morton: Iran is in ferment and the British Intelligence Service wants Tana Standish’s assessment. It appears that CIA agents are painting too rosy a picture, perhaps because they’re colluding with the state torturers… Allegiances and loyalties are strained as Tana’s mission becomes deadly and personal. Old friends are snatched, tortured and killed by SAVAK, the Shah’s secret police. She has to use all her skills as a secret agent and psychic to stay one step ahead of the oppressors and traitors. As the country stumbles towards the Islamic Revolution, the Shah’s grip on power weakens. There’s real concern for the MI6 listening post near the Afghan border. Only Tana Standish is available to investigate; yet it’s possible she could be walking into a trap, as the deadly female Spetsnaz fighter Aksakov has been sent to abduct Tana. 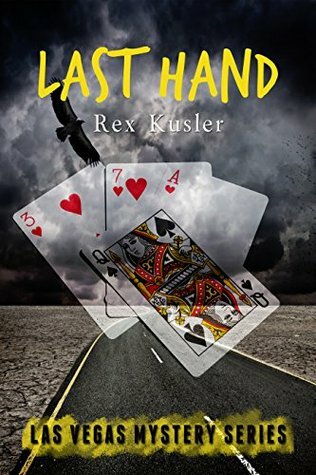 7: Last Hand(review copy) – Rex Kusler: Tracy Green was a master at playing the odds. A professional stock trader, she made extra money as the head of a team of card counters. They had remained under the radar for years, operating shrewdly six times each year during the busiest holidays. But their luck finally went south the night they were barred from playing at the Clifton Casino in downtown Las Vegas. That wasn’t the worst event of the evening—a couple hours later Tracy encountered a deadly flaw in the notion of her own invincibility. She was shot to death in her lavish home on a secluded road north of Las Vegas. With little evidence and meager leads, Private Detectives Alice James and Jim Snow muddle through this new investigation as they continue to deal with Snow’s lackadaisical attitude and Alice’s desire for at least a modicum of professionalism. 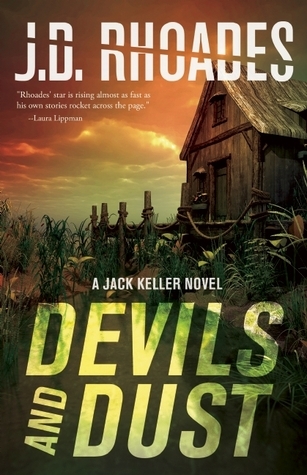 Author Lee Mims is a fellow North Carolinian. 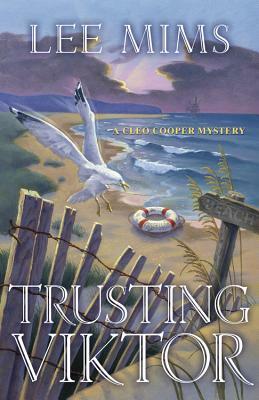 I always enjoy reading books by local authors set in areas I’ve visited myself, Holding a degree in geology and having worked in the field brings gravitas to her character Cleo Cooper, a geologist working on a natural gas project off the coast of our state. She’s sunk her life savings into the deal and hopes for a big payoff. But in this mystery, something else is going on as well. Cleo is attacked late one night on board the drillship, a large hairy man attempting to rip her clothes off. Head knocked, she loses consciousness, only to come to asleep in her bunk, clothes arranged neatly, and no sexual assault on her person. And no one seems to know anything untoward happened to her. When a body turns up floating downwards from the ship, the police show up asking questions. Cleo, while not getting a good look at her attacker, it was pitch black, is pretty sure he’s the one. She can’t explain and the cops keep att it, especially when it’s learned the man’s head was fractured. That sets Cleo to wondering exactly what happened. Her ex-husband was on board. Their relationship is friendly and she wonders if he’d saved her. 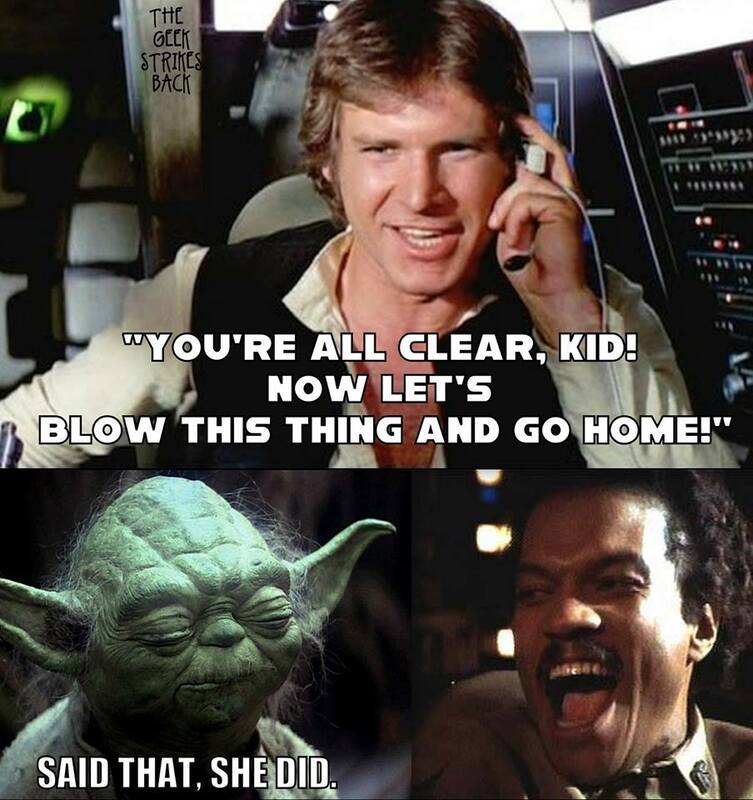 Had another? 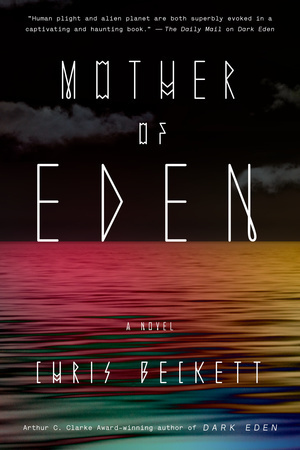 The Viktor of the title is a young Russian, twelve years her junior, who she first met in the Gulf of Mexico when he saved her life while diving among drill rigs and in danger of drowning when caught up in wreckage. They become brief lovers, then when he shows up replacing the dead man off North Carolina, she gets her hackles up. Friendly enough, almost like a puppy dog, she fends more advances off. A fabulous treasure that someone seems ready to kill for. Cleo keeps doggedly pursuing each clue she uncovers. I like the author’s writing style. Smooth and clean, she keeps a nice pacing on her tale, no dull stretches, as she moves toward the conclusion. Second in the series, I definitely have the first on my reading radar. Can be ordered HERE. 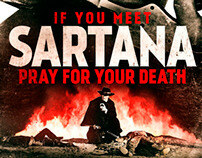 IF YOU MEET SARTANA PRAY FOR YOUR DEATH was the first of five official films to feature the character. there were a number of films that featured the fellow that were mere ripoffs riding the coattails of the franchise. Gianni Garko played him in four of the spaghetti westerns and George Hilton essayed the role in the third entry. This opening film is loaded with veterans of the genre in Klaus Kinski(Morgan), Fernando Sancho(Jose Manuel Mendoza), and William Berger(Lasky) being the main ones. A few other sprinkled through in minor roles. The plot involves an insurance swindle perpetrated by those folks in charge, a bank director, rich men, hiring a Mexican gang, Mendoza’s, to steal a strong-box, and an American gang, led by Lasky, to kill the Mexicans. 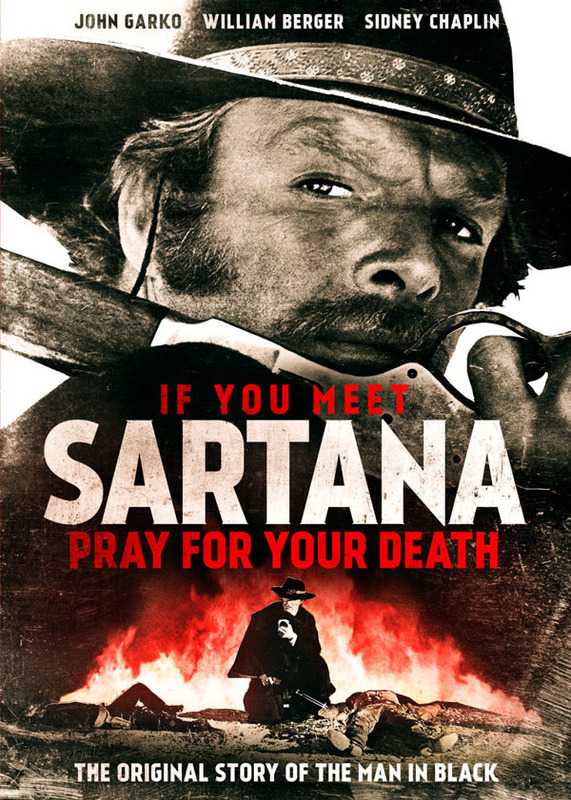 A mysterious stranger, Sartana, steps into the middle of this fight, revolving around rival gangs, the town’s bigwigs and the search for the missing loot. 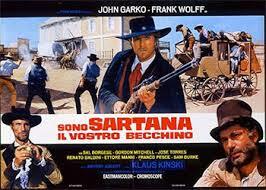 The usual sorts of double crosses follow, Sartana making sure he comes out on top. 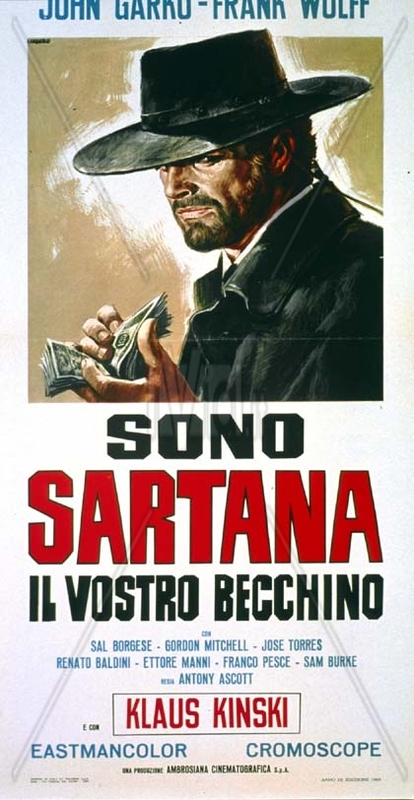 The name “Sartana” first appeared in the film Blood at Sundown (Mille dollari sul nero, 1967), in which Garko played an antagonist called El General Sartana, completely unrelated to the later film series. 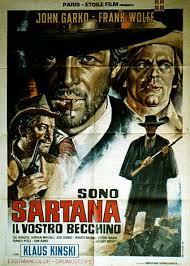 But it was noticed, the film’s success in Germany, known by the short title Sartana. Italian producer Aldo Addobbati noticed that and set up a production deal with a German producer in Italy. Garko was signed with a clause giving him script approval. One of the best of the spaghetti genre.